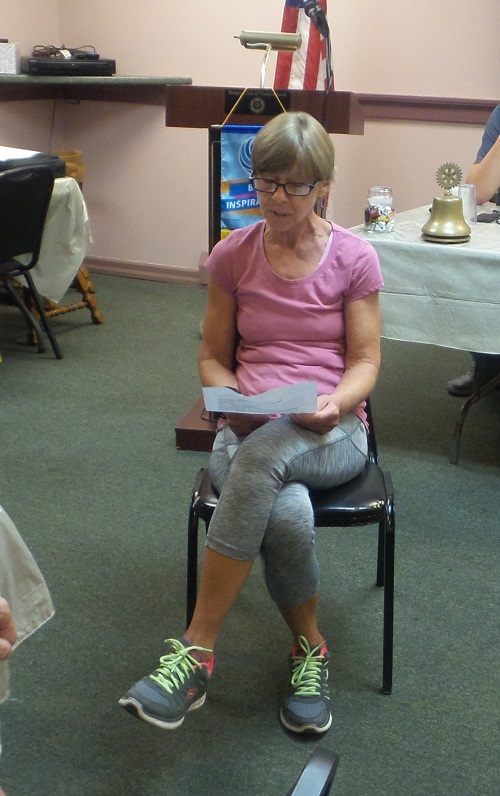 At the Sept 6 Tunkhannock Rotary Luncheon at Purkey's Pink Apple, the guest speaker was Donna Fetzko. Donna spoke about the fact that untreated chronic stress can result in many illnesses including major immune suppression plus cardiac illnesses. Walking and eating healthy can help manage stress, but there are 3 additional things that we can do. 1. Posture is an issue – We sit a lot. Sitting is the new smoking disease. We are sitting with rounded shoulders and rounded lower back. Lift up and wag your tail. 2. Practice breathing to calm our monkey minds – Buddha says our mind is filled with crazy monkeys jumping around. Calm and focus your mind to tame the monkeys. Breathing can help to calm your mind and be in the moment. If you can do it for 5-10 min, it is a form of meditation and can even help you sleep. However, do not do when driving. 3. Yoga Moment – Donna ended by leading the group through a series of yoga moves to relax various parts of our bodies.